As Australia looks to launch a national space agency, the Turnbull government has signed a treaty with the National Aeronautics and Space Administration (NASA) reaffirming a commitment made by the two nations more than 50 years ago. 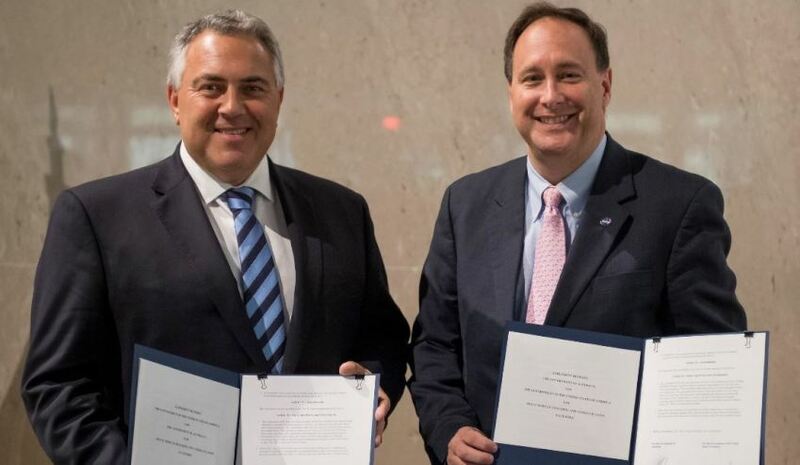 Ambassador Joe Hockey signed the historic Space Tracking Treaty on behalf of Australia, with the Acting Administrator of NASA, Robert Lightfoot Jr, signing on behalf of the USA at a ceremony at the Australian Embassy in Washington D.C. The Space Tracking Treaty covers civil space facilities owned by NASA and located within Australia, including the Canberra Deep Space Communication Complex (CDSCC) at Tidbinbilla, as well as facilities in Western Australia and the Northern Territory. Acting Minister for Industry, Innovation and Science, Michaelia Cash, said Australia is continuing to play a major role in NASA's exploration of space. “The signing of this treaty comes at a very important time in the development of the space industry in Australia given the Turnbull government’s commitment to establish a national space agency," Minister Cash said. "Australia plays an integral part in space vehicle tracking having assisted in almost all of NASA’s human and robotic missions to space." "Our space collaboration with the United States of America began in 1957 with the establishment of a radio tracking facility in Woomera and was formalised in 1960 with the signing of a bilateral treaty on space vehicle tracking. "This treaty remains the foundation for a continued co-operative program between Australia and the United States." Lightfoot said Australia’s contribution to NASA's exploration of space over the decades had been immense and the treaty signing would ensure the relationship would continue. CSIRO Chief Executive Larry Marshall added he was delighted with the signing of the treaty and the sharing of knowledge that will arise from this opportunity. "For more than 50 years, CSIRO has been proud to be one of NASA’s homes in the southern hemisphere, leveraging our geography and sharing in the world-class capabilities of our scientists," Marshall said. "From humanity’s first steps on the Moon, to flying past Pluto, to Cassini’s recent descent into Saturn, CSIRO and NASA have partnered to not only see more deeply into our universe, but inspire the next generation of scientists." Australia's space sector is already making headway. At the International Astronautical Congress (IAC2017) in Adelaide last month, Boeing confirmed the work of its Brisbane team will contribute to the CST-100 Starliner for NASA service missions to the International Space Station. The work will provide a high-resolution, interactive, real-time simulation to supplement Boeing's physical Starliner simulator. The VR technology is a low-cost training alternative for astronauts to familiarise themselves with operating Starliner and perform training procedures, including how to dock with the International Space Station. South Australia has well and truly put its hand up to be the home of the national space agency, having already established its own South Australian Space Industry Centre (SASIC). Located within the existing Defence SA headquarters in the Adelaide CBD, SASIC will build on the work of the existing space industry office at Defence SA to drive space industry innovation, research and entrepreneurial development. South Australia Premier Jay Weatherill said the new centre is the next step in SA's role as the nation's leader in the thriving space industry. "South Australia has always been a national leader in space innovation," the Premier said. "This year marks the 50th anniversary of Australia’s first satellite launch from Woomera, which made Australia the third nation in the world to launch a satellite into space from its own territory.